The roles were reversed at the Dog & Duck as 10-man Spalding United fought back to gain revenge on AFC Rushden & Diamonds. Back on November 1, Diamonds had hit back from a goal down with 10 men to claim a 2-1 success in Lincolnshire. But this time the boot was on the other foot as Andy Peaks’ side conspired to throw the game away when they looked to be in control after an explosive start to the second half. 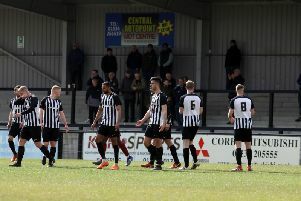 The defeat represents a setback for Diamonds as they bid to secure a play-off place in the Evo-Stik Northern Premier League Division One South but they still remain on course to achieve that particular target, although further big games lie ahead. For Spalding, the victory threw them back into contention for the title as they recorded a first win under Chris Rawlinson, who took the reins following the departure of Dave Frecklington last week. There was a real big-game feel to this one before kick-off and the players didn’t disappoint as they produced a highly competitive and very watchable contest. The first half was even with chances going begging at both ends. Tom Lorraine saw a thumping header from a Ben Ford cannon off the inside of the post while Nathan Stainfield followed suit at the other end as his volley clipped the far upright with Matt Finlay, who was making his 150th appearance for Diamonds, beaten. Finlay produced a fine save to tip over Bradley Wells’ looping header just before the break but the game exploded into life early in the second half. Lorraine was hauled down on the edge of the box inside the first minute after the restart and Liam Dolman’s low free-kick proved to be too good for Michael Duggan in the Spalding goal. And it was looking even better for Diamonds soon after when Neal Spafford was sent off for a second bookable offence after he brought down Lorraine. That gave Diamonds 40 minutes at 10 men with a 1-0 lead but, instead, the red card only galvanised the Tulips who never really looked back. Wells and Leon Mettam looked a threat all evening and the warning signs were there when Adam Jackson’s fizzing long-range effort just cleared the crossbar. And Spalding were back in it on 67 minutes when Dolman brought down Paul Walker in the area. That gave substitute Jenk Acar the chance to level things up and his duly did by beating Finlay from the spot. And just seven minutes later, the turnaround was complete. Mettam got in behind the Diamonds defence and was hauled down by Brad Harris 20 yards from goal. The Diamonds defender was booked but things got a whole lot worse as Mettam picked himself up to curl a sensational free-kick into the top corner. It was a goal worthy of winning any game and, as it turned out, it won this one. Diamonds’ response was disappointing. Aside from Taylor Orosz shooting straight at Duggan late on, they struggled to carve out any clear-cut chances while Spalding defended efficiently as they protected their lead. They were well worth it by the end and were able to celebrate a job well done while Diamonds were left licking their wounds. But there is no time to dwell on it. Another huge game at Basford United, who are leading the chasing pack for the play-off places, awaits on Saturday. And Diamonds will have to be a whole lot better if they are to bounce back at the first attempt. Diamonds: Finlay; Ford (sub Parsons, 87 mins), Harris, Dolman, Brown; Farrell, Bunting, Leslie; Koriya (sub Brown-Hill, 57 mins), Lorraine, Shariff (sub Orosz, 76 mins). Subs not used: Wilson, Heath. Spalding: Duggan; Walker, Stainfield, Spafford, Jackson; Beeson (sub Acar, 54 mins), Downey (sub Higginson, 62 mins), Whitehead, Lemon; Wells, Mettam (sub Lockie, 90 mins). Sub not used: Butland. Goals: Dolman (47 mins, 1-0), Acar pen (67 mins, 1-1), Mettam (74 mins, 1-2). Sending-off: Spafford (second bookable offence).